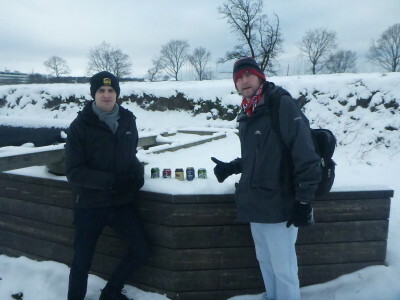 My latest Denmark adventure was a surprise and an extra. 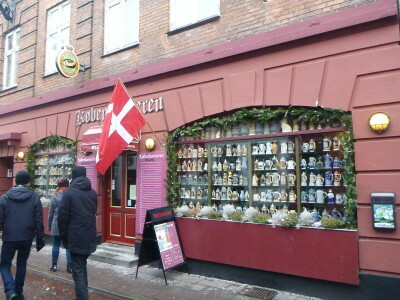 I first visited the Danish capital Copenhagen back in 2006. 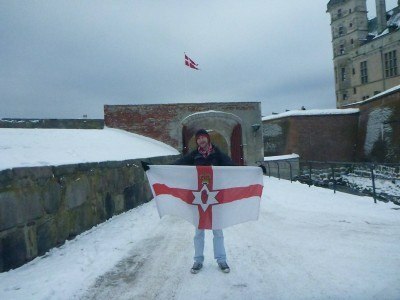 That time it was a lads trip to Copenhagen for the football as my team Northern Ireland drew 0-0 with the Danes and my mates and I partied in the city. 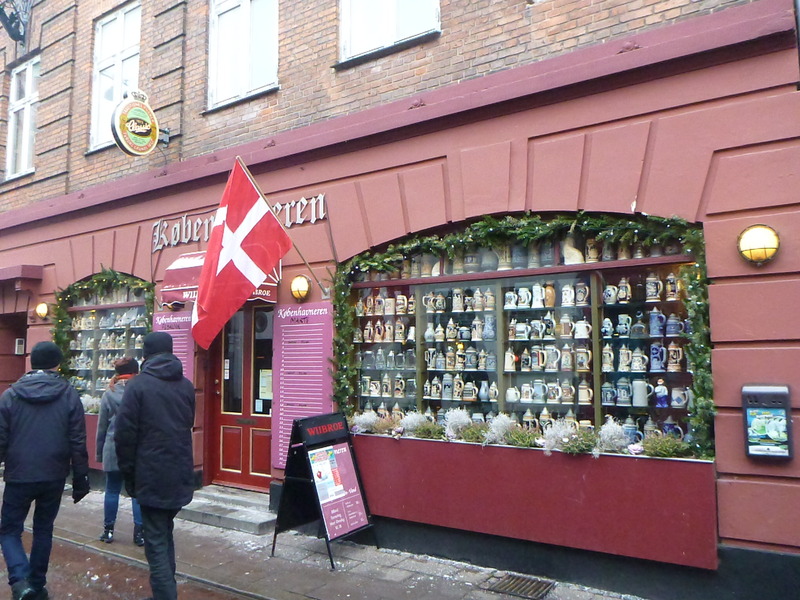 Second time round, in February 2015 I toured the capital city of Copenhagen again, delve into the mysterious enigmatic wonders of the Freetown of Christiania and visit the magical town of Helsingor. Hamlet’s Town. The last one on the list was Hamlet’s Town. It was a tad more inspiring than normal though. 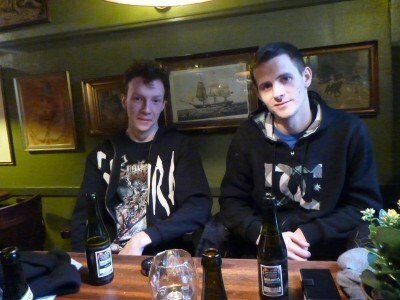 For one main reason – my old flat mate and backpacking buddy Daniel Evans was travelling with me once again as we got a train and a ferry across to Denmark from Sweden. If you read my epic 2009-2010 adventures in Australia with Daniel you’ll be aware of just how exciting and crazy it all was back then. 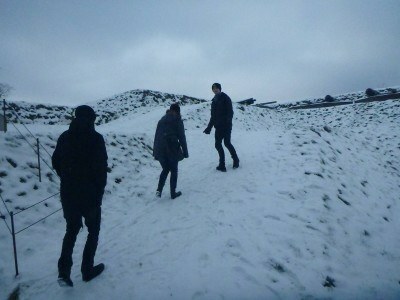 It was Sofia and Daniel’s idea to head over to Helsingor and I loved the spontaneity of it all. Daniel and I bid our farewells in Tasmania on an emotional night at Huon Valley then a pint in Hobart in February 2010 and exactly 5 years later we were reunited. 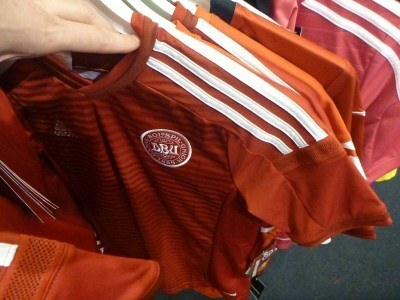 In Sweden. 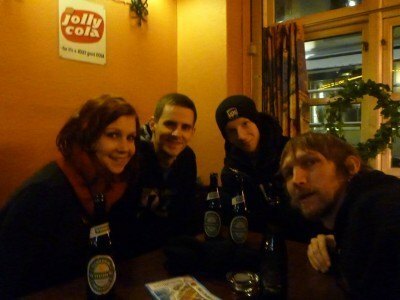 I got a train from Malmo north to the town of Angelholm and the 5 years reunion was complete! But the backpacking journey just had to happen so after a crazy reunion night out in Angelholm (darts, beer, food and Smallville), we headed with Daniel’s girlfriend Sofia Lundahl and her brother Simon on a Danish adventure to the town of Helsingor. As far as getting to Helsingor, there are the usual three options – land, sea and air. By land from Copenhagen, you’re only 45 minutes away on the train. You can also fly into Copenhagen of course but our option was a real reminder of my Australia trip with Dan when we did the ferry from Melbourne to Devonport, Tasmania. 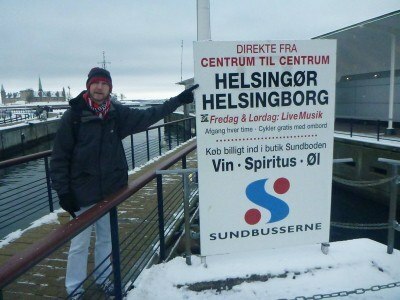 We decided to get the ferry across to Helsingor from the Swedish town of Helsingborg. 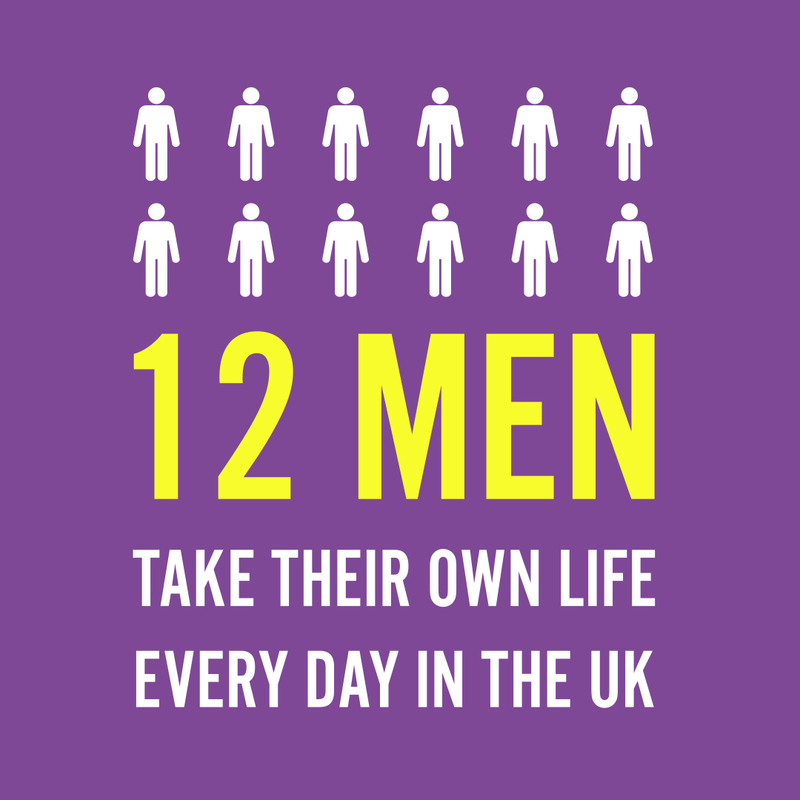 The distance is only 828 metres and only takes 20 minutes. 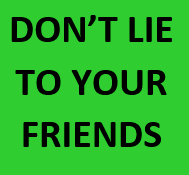 Prices vary depending on time of year and how many are in your group. Sofia made sure we got 4 day tickets to include the ferry return and the train return from Angelholm to Helsingsborg as well. You save money this way. 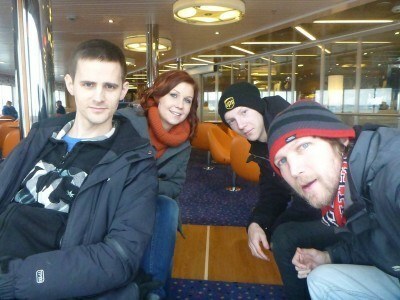 We left early morning and the ferry wasn’t full. 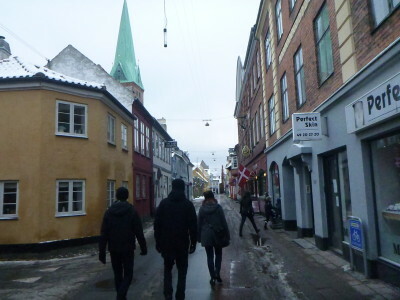 Once you arrive off the ferry into Helsingor, everything you want to see in the town is easily walkable. 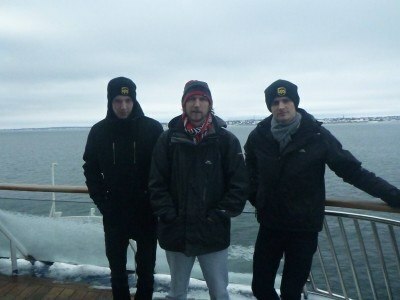 Simon, myself and Daniel on the ferry between Helsingborg, Sweden and Helsingor in Denmark. Here are the main things we did on our day out there, I kind of compiled it into my favourite touristy top 5 then a personal random top 5. The main attraction in Helsingor is obvious when you arrive. 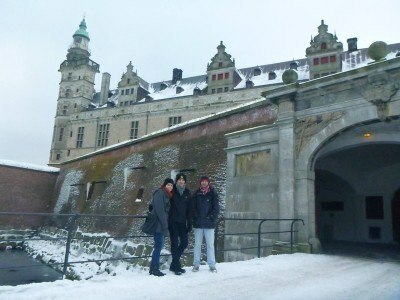 The magnificent Kronborg Castle sits by the harbour on the end of the peninsula and is hard to miss. 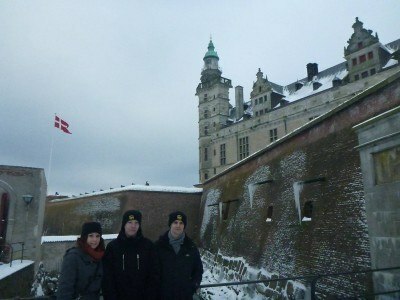 This Castle is one of the top sights in Denmark, so it’s very touristy of course. 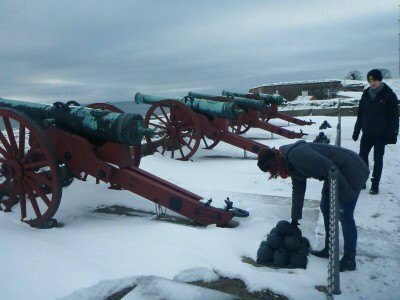 We visited in February on a cold snowy day though and loved it – barely a tourist in sight. Apparently in the Summer months it gets packed. 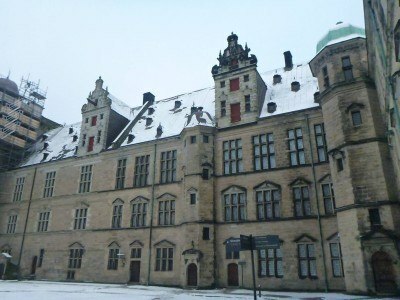 Kronborg Castle has been covered on countless travel blogs and magazines down the years so just a quick overview from me – it is officially known as Kronborg Slot and was called Elsinore Castle in the Shakespeare play Hamlet. Due to its strategic position at the mouth of the Oresund and the border between Sweden and Denmark, the location is of high importance and was once the place where boats were checked for customs entering the strait. 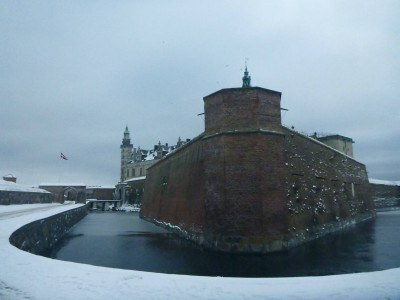 You can walk all around the outside of Kronborg Castle for free. 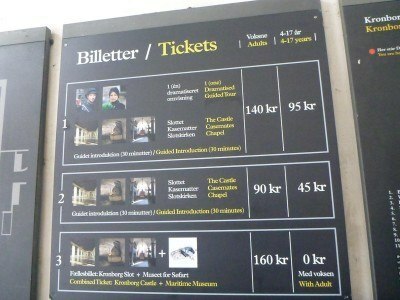 To enter inside the castle and the museums, you’ll need to buy a ticket. Prices vary. 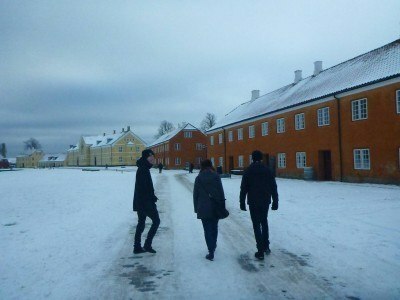 When we were there the main grounds were free entry, there was a charge of 90 Kroner for Castle and Chapel entrance or 160 Kroner for entrance to everything and a guided tour. 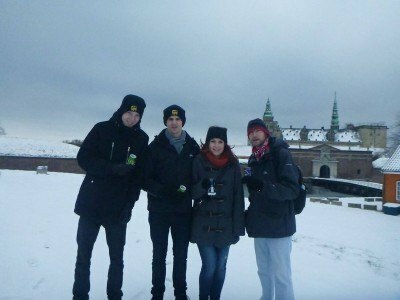 Aside from admiring the views, the castle and the cannons, I had my backpack with me full of cans of ice cold beer and we all cracked one open in the snow. Having a beer in the snow at Kronborg Castle! 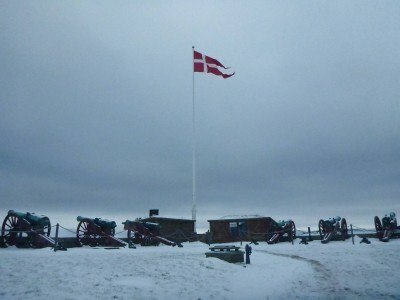 On your way to Kronborg Castle, you will pass by a seafront exhibition centre. 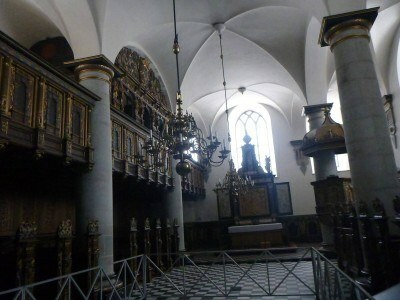 In here there are coffee shops, a library, wifi and concerts and during some months there is a free guided tour. Cool and modern but an anti-climax compared to Kronborg which is the main event. 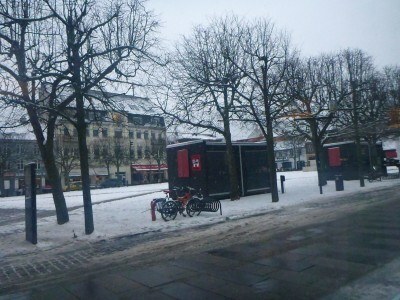 When you see the Axeltorv Square in downtown Helsingor, the history of it might easily escape you. There used to be a farm in the inner city centre but it burned down to the ground in 1684 and so the locals decided to build a square here. It became a trading square for merchants and farmers and of course now has a lot of restaurants on it. You might have been to Copenhagen and seen this really small statue of a Little Mermaid with hundreds of tourists (myself included) taking selfies next to it? 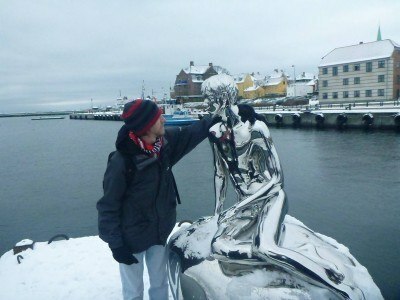 Well here in Helsingor they have a silver naked guy right by the harbour. It’s shiny and he even has a set of silver balls and eerie eyes! I’ll also be honest that I made the name “The Little Merboy” up myself – it may not be called that. 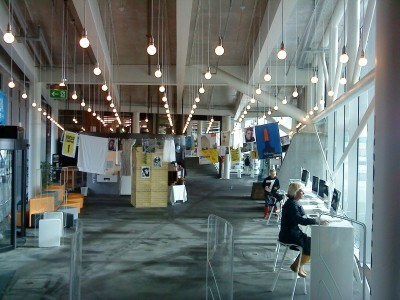 The People’s Museum is small and entry is free so it’s worth a look around. 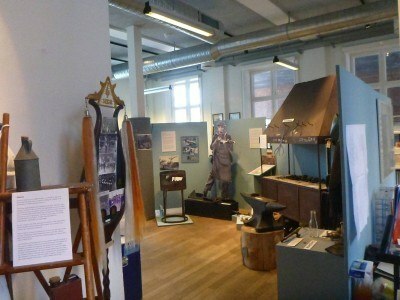 It gives a history into the people of Helsingor and has a focus on ships and the importance of the harbour. Like all my journeys, I like to check out a few other random things on my trips to touristy cities. These are 5 cool other things we (I) checked out when backpacking in Denmark ‘s Helsingor. 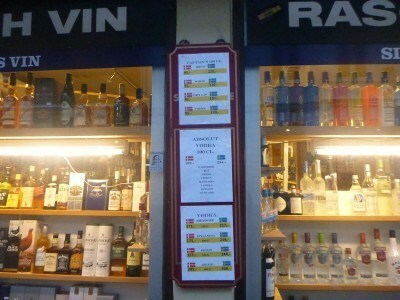 Here in Helsingor, the price of booze is much much cheaper than it is across the water in neighbouring country Sweden. 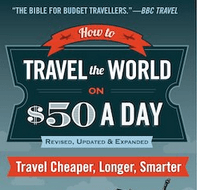 So much cheaper, that it is still cheaper for Swedes to cross by boat, buy their booze and take it back to Sweden! I was still backpacking though so obviously was only browsing and not buying as I didn’t want to carry it, or spend unnecessary cash on it. 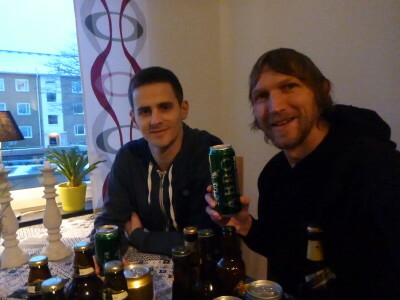 After a few beers, Daniel and I traditionally hit onto the whiskeys and he lives in Sweden but buys some of his booze in Denmark. 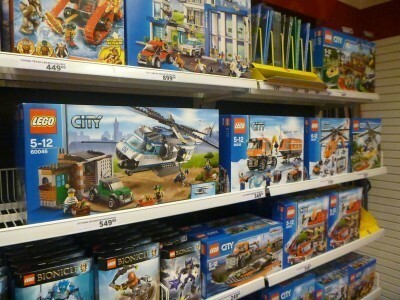 We are in Denmark don’t forget and I grew up loving Lego toys. Following my visit to Legoland in Windsor, England, every time I’m in Denmark I love to check out the Lego for sale in the shops. For me, Danish cheese is the best cheese in the world. I simply adore Danish blue and have yet to find a cheese in Denmark that I don’t like. I love the smell of it, the taste of it. 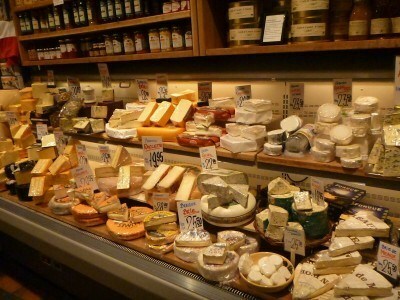 I’ve been known to eat full blocks of cheese without any accompaniment, I popped into a massive cheese shop in town for a free sample and a nosey. We popped in for a browse in the shopping centre since it was a cold windy day, the Helsingor ByCentre has a range of shops though I admit I spent most of my time looking for Lego, cheese and football shirts. When Daniel and I are together, beers are often involved. 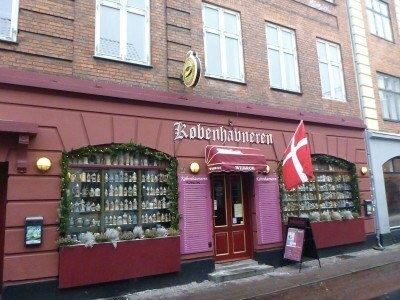 We wanted to find an authentic Danish style bar in the town and the Kobenhavneren: Old Danish Pub seems to be the pick of them. 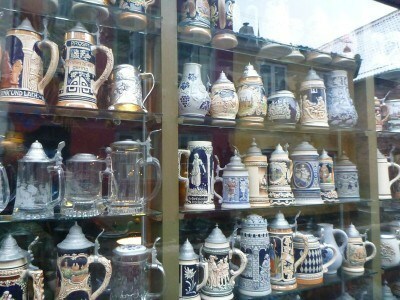 They have beer containers on the walls and decent Danish lager but it is a bit of an old man’s pub and can get smoky! Admittedly Helsingor is not a big boozing town (well it didn’t appear to be in the winter when we went) despite the cheapness of alcohol here. Sofia’s brother Simon wanted to have a pint of Guinness with me in the town’s Irish Pub, but it was completely closed so we had to wait until we got back to Sweden to enjoy a pint of the black stuff (I know I should be drinking Danish stuff – but I had loads of Danish and Swedish beers and Simon really wanted a Guinness with me!) 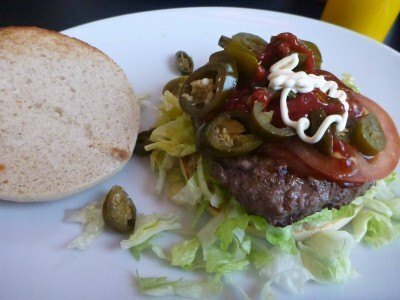 We did manage a beer (in Strandborg Bar) and a Danish-US style burger (in a local fast food place) before we left Helsingor though. It was an absolutely busy and crazy day yet again and my thanks to Sofia, Daniel and Simon for helping organise and make it such an enjoyable time in Sweden and Denmark. I thoroughly recommend visiting Helsingor and whether you go via Sweden or Denmark, be sure to spend at least more than 5 hours in the town to see it properly. It’s more than just the castle as we found out! 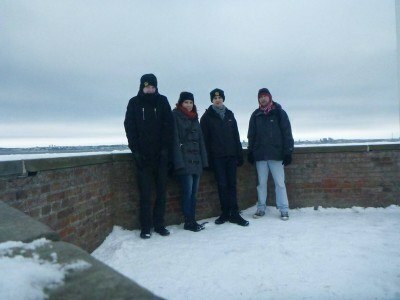 This entry was posted in Angelholm, Denmark, Europe, Helsingborg, Helsingor, Sweden. Bookmark the permalink.